After arriving from the Dragon Aerie through the bridge, there is a bonfire in a small building left of the stairs. Interact with it to recieve a surprise visit from the Scholar of the First Sin. 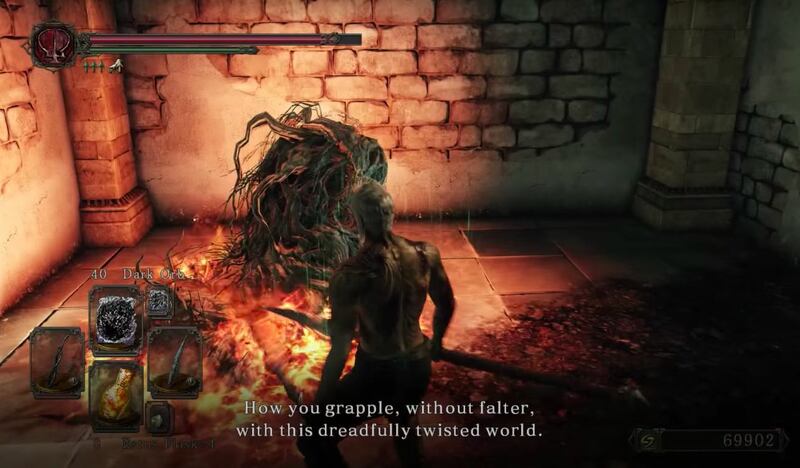 When he finishes with his dialogue, he will disappear and make the bonfire available for activation. Head up the stairs and you will face a Drakekeeper. 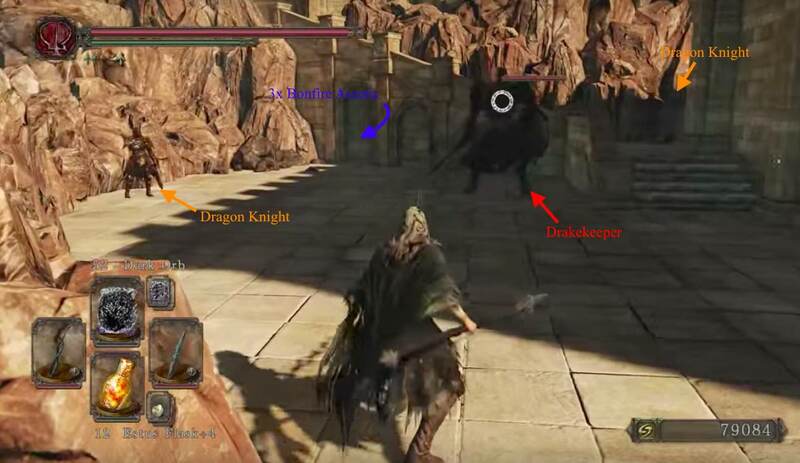 The Dragon Knight on the left will remain non-hostile, even going as far as performing gestures, unless the player has joined the Dragon Remnants Covenant or you flee from a battle against the Drakekeeper. Behind them, in the arches under the upcoming stairs, is a Pharros' Contraption which reveals an illusory wall on the left. Inside is a metal chest with the Judgement Set. Take a right just before the stairs and go through the doorway to find a metal chest with 3x Bonfire Ascetic. 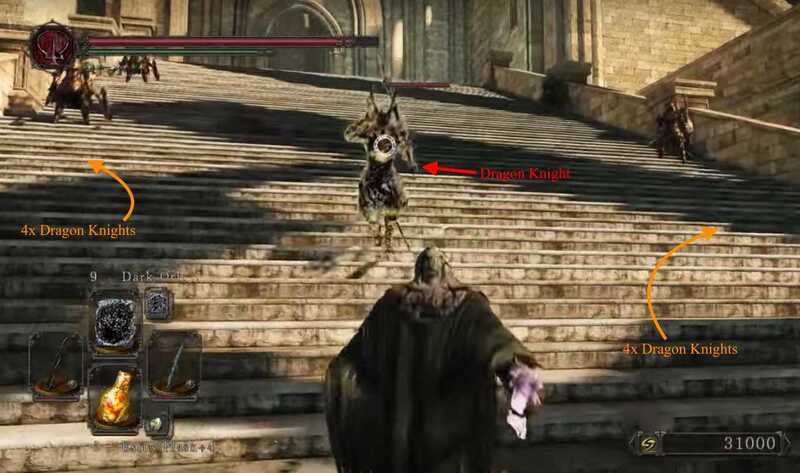 Having looted it, continue up the aforementioned stairs -passing another passive Dragon Knight- and you will find a Drakekeeper ready to attack. Not only is there the added pressure of two Dragon Knights watching, this Drakekeeper also wields a two-handed which makes this fight trickier than the sword-wielding one earlier. 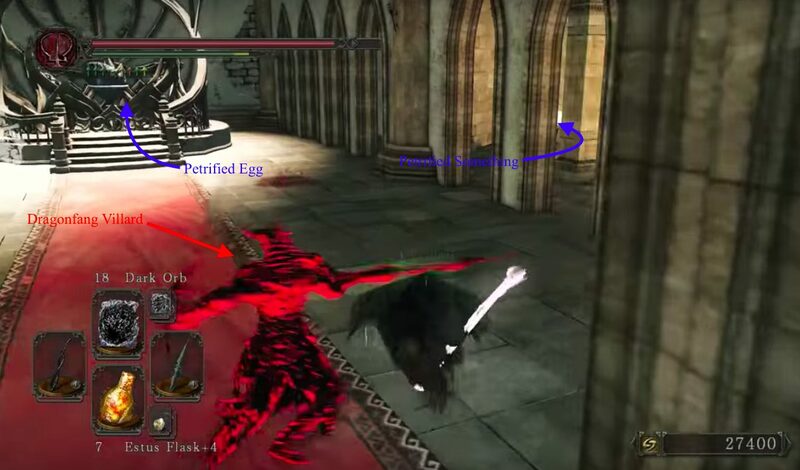 This enemy has a relentless flurry and is only open to larger attacks after he swings his mace overhead and smashes it into the ground. Melee - Try to keep still and lure him into such an attack. Alternatively, fight him from below on the stairs and most of his attacks will swing over you. Ranged - Lure him back to the stairs you came up and safely snipe him from there. Continuing through the arches guarded by the two Dragon Knights, and up the first flight of stairs will be a chest containing a Twinkling Titanite. There will be another set of stairs to climb into a gazebo-esque structure with two Dragon Knights and a Faintstone. Jump across through the opening in the railing to the next platform to find a metal chest on the right, with a Drakekeeper's Greataxe and Drakekeeper's Greatshield. Drop down to the stairs below and head up to find another Drakekeeper with a sword, and another two Dragon Knights. 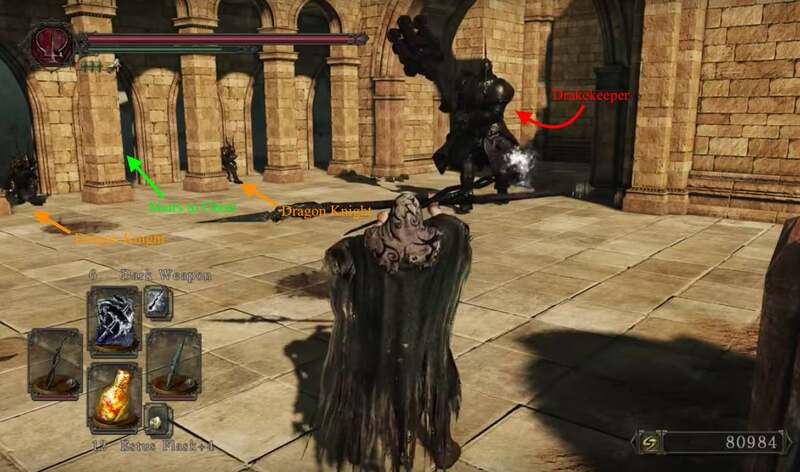 After he's dealt, head left of the stairs to drop down into a lower level and find a chest containing a Titanite Slab.Proceed through the doorway to find Drakeeper -wielding a Great hammer and Greatshield- and a Dragon Knight. 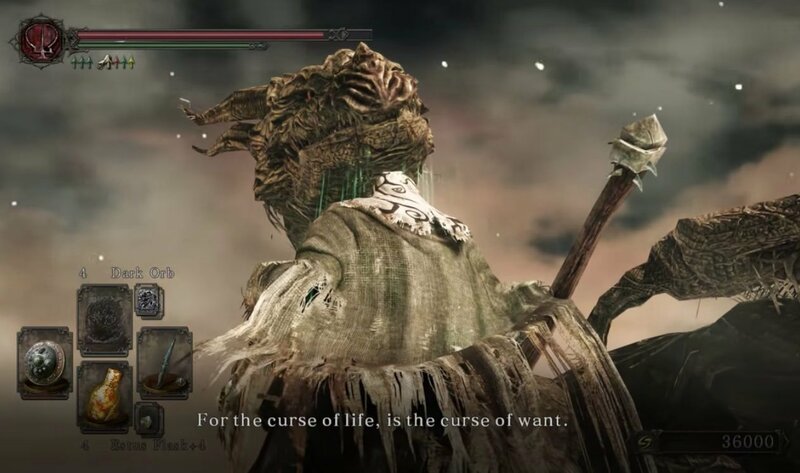 To the right of the Knight, is a corpse holding Skeptic's Spice and Twilight Herb. Going through the door, inside is a metal chest containing Third Dragon Ring, that triggers the invasion of Dragonfang Villard upon opening, and a long staircase up. While the invasion is in motion, he actually spawns upstairs at the shrine and will wait for you there. Once defeated, feel free to take the Petrified Egg from the shrine here; this item is use to join the Dragon Remnants later, after you give it to Magerold of Lanafir at Iron Keep. Now head to the edge at the right side to find another metal chest containing a Petrified Something, then drop down once again onto the ledge below for another metal chest containing the Crystal Magic Weapon spell, and a Fragrant Branch of Yore. Drop down one final time to arrive at the landing you initially dropped off to find the chest with the Titanite Slab. Opening the wooden door and another wooden door will lead to a massive staircase leading up. You'll immediately notice the rows of Dragon Knights lined up on either side of the staircase, and may be intimidated. Don't worry, as the same rules apply as all the others, and will not attack you unless provoked. That being said, out of the total 9 on the stairs, the one at the top, in the middle is the only one that will aggro automatically. Defeat him then proceed past the eight on the stairs, and the three in the subsequent corridor. Through here, you'll come out onto a large open platform with the Ancient Dragon waiting for you. Talking to the ancient one will award you with the Ashen Mist Heart. Remember all of the strange tree-giant hybrids that are laying around in various places? Now you can finally interact with them. You can also choose to fight him or not, but there's no real need to. These enemies hit hard, and some of them are relatively fast for their size. They are vulnerable to bludgeoning attacks, and weapons such as the Large Club or Great Club devastate them. With a strength of around 40 and a fully upgraded weapon, expect them to drop after 2 or 3 hits. If you are using such weapons, it's recommended to use hit and run tactics in order to avoid their oft devastating attacks. They are vulnerable to fire. An effective tactic is to simply circle around them to the right and hit them in the back 1-2 times, bait their combo, then repeat. These guys are fast, but they are easily stun-locked, even with weapons that deal medium poise damage such as a Claymore. 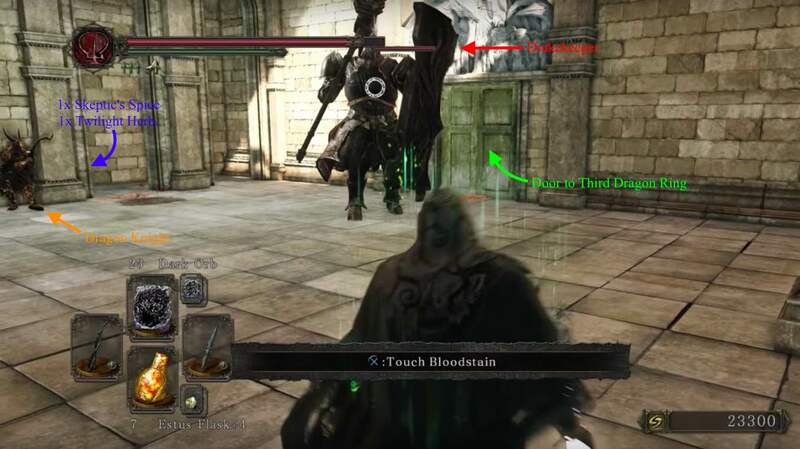 They are faster if not meaner than they ever have been but they actually have low poise as they can easily be stun lock by heavy weapon even 2 hits from normal greatsword, such as a Claymore. Use pyromancy on them for high amounts of damage. Beware they have a shield smash skill just like us if you decide to block all their combo.